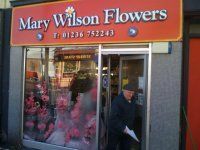 A special welcome to Mary Wilson Flowers, we are a dedicated family run business which has been established for over for over 33 years. We are one of the most reputable florists in Airdrie, and we aim to provide a first class service for all of our customers. We take the time to listen to our customers needs as we believe listening enables us to deliver more specific requirements, making our services that bit more personal. Based locally we are ideally located for anybody in need of flowers in Motherwell and the surrounding areas. We are also willing to travel throughout North Lanarkshire to meet the needs of our customers. 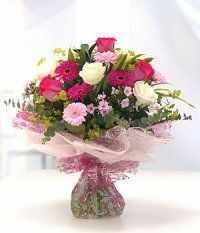 We specialise in all aspects of floristry work and all of our staff are City and Guilds trained. We work hard to exceed your expectations and provide a prompt, professional and reliable service. So, whether you are looking for a small gift for someone special, or a large bouquet or arrangement for a birthday, anniversaries or "just because", rest assured that we are the company to call. No matter what the occasion we will have something to suit you. On special occasions such as Christmas, Mothers Day and Valentines Day demand is always higher but we have seasonal gift ideas designed to be personal and special to the individual, making them great value for money. So why not visit Mary Wilson Flowers in person and see what we have to offer? We are confident that with our wide selection of fresh grade1 flowers, you will not be disappointed.